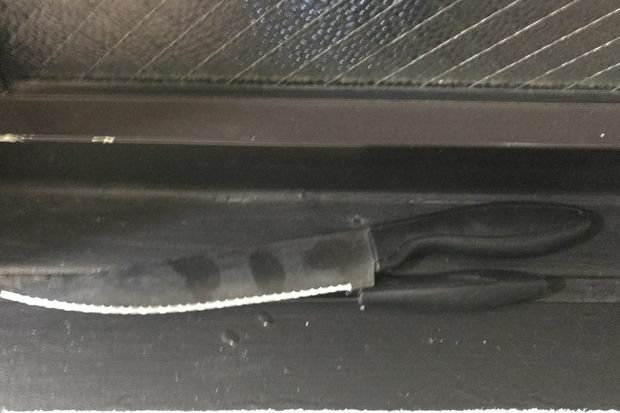 Police said the suspect charged at them with these knives. HAMILTON HEIGHTS — NYPD officers shot an emotionally disturbed man who they said charged at them with a pair of knives inside an apartment building hallway Sunday — the second police-involved shooting captured by body cameras. Police were called to the sixth floor of 610 W. 143rd St., between Broadway and Riverside Drive, for a suicidal person about 5:30 p.m., the NYPD said. One of the officers then opened fire, wounding the 27-year-old man's left leg, according to the NYPD. Police performed first aid before the man was taken to Mount Sinai St. Luke's, police said. He'd stabbed himself in the stomach before officers arrived, police said. He's expected to be charged, but hadn't been as of Monday morning, police said. It wasn't immediately clear what he'd be charged with. The responding officers were taken to New York-Presbyterian/Columbia University Medical Center for observation, police said. The NYPD plans to release body-camera footage of the shooting at some point, but the department yet to set a date, Police Commissioner James O'Neill said. "We’re in the initial stages of the investigation with our Force Investigation Division. We have to, of course, talk to Cy Vance, the Manhattan District Attorney," he said.